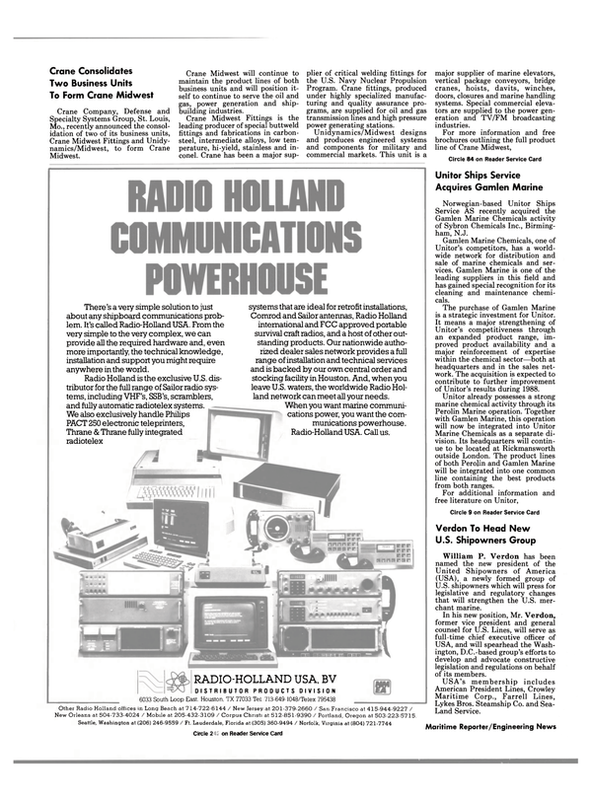 This March 1988 issue marks a milestone in the publishing history of MARITIME REPORTER/Engineering News. It is the first A.W.O. ANNUAL to be published by MARITIME REPORTER and it establishes March as A.W.O. month. Every year from 1988 on, the March issue will be the A.W.O. ANNUAL. This annual issue decision was reached with the full cooperation and support of the American Waterways Operators, Inc. Much of the editorial content was contributed by A.W.O. Truly national in scope, the American Waterways Operators, Inc., is the most prominent and influential industry organization throughout the entire U.S. shallowdraft sector—both coastal and inland. A.W.O. membership, including shipyards and vessel operators, now numbers over 300 companies, of which 200 are leading vessel operators with fleets totaling more than 5,500 tugs and towboats and more than 32,000 barges. MARITIME REPORTER is proud to be associated with A.W.O. in any effort to support the health and growth of the vast and vitally important coastal shallow-draft and inland sectors of the U.S. marine industry.